No-One Will Exhibit your Art Work? Just Leave it on the Bus…. It is true! A new exhibition, carefully curated at the KK Outlet, Hoxton Square of artwork that has been left on London Public transport – buses, trains tubes and taxis is on now! So if you are a hard up artist or art student…you know what to do….get on the tube to Edgware, or Morden , or High Barnet, or Cockfosters, and just leave your art work all wrapped up in brown paper and string on the tube at the last stop.. .much safer than exiting at a random station, when someone else might take it home. Wait a couple of years and BHAM! Free exhibition. I am definately gonna try it. I am going to rustle up a bit of a picture, wrap it up, and leave it on the bus and …wait. But then it might not ever happen again, and then one would be a bit peeved! Good idea for an exhibition. It is on until the 30th of June so am going to go down anyway as it sounds like a really fun idea. Still think I might leave a picture on the train anyway. 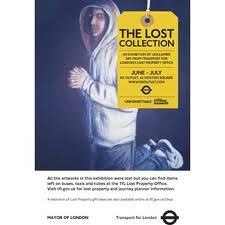 In fact if every art student in the whole of London left a piece of art on a public transport machine. Now that might start a little art revolution! Another of those secret pleasures that is now completely ‘out of the bag’. As I am now so offically an anorak, it is ok for me to admit to having a soft spot for this song. So uncool. But there is something about that bit at the end, ‘then one by one the stars would all go out, then you and I would simply fly away’ that used to get me, and still does.